Mabel R. Buss passed away peacefully at Eger Nursing Home on Thursday, September 27, 2018 at the age of 95. Born in Staten Island, NY and a graduate of McKee High School, she was a homemaker and a wife to the late, Russell Buss and a loving mother to her three children, Stephen and Barry Buss and Marilyn Miller. 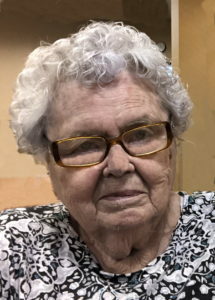 Mabel had many hobbies that included craft work, needle point, crocheting and baking but she spent most of her time with her loving family which she truly enjoyed the most. Mabel will be deeply missed by all who knew her. My deepest sympathies to everyone. She was so special to me.